Jason & Courtney Janes – Janes Surveying, Inc.
Jason Janes graduated from high school in 1991 and immediately joined the United States Air Force, where he traveled the world as a Fire Protection Specialist. Upon his return from the military, he started working for The Crane Design group in Hannibal, Missouri. John, his father was employed as the Chief Surveyor at the time. After about a year, John and Jason decided to start their own surveying company. In April 1997, they opened Janes Surveying in its current location, 222 South Main Street in Palmyra, Missouri. Jason took the reins of the company from his father in the fall of 2008. In the same year, he graduated from Hannibal-LaGrange University with a Bachelor of Science in Organizational Management. He is a licensed surveyor in multiple states. Jason and his wife, Courtney, live in rural Palmyra, with their sons, Jackson and Jonas. 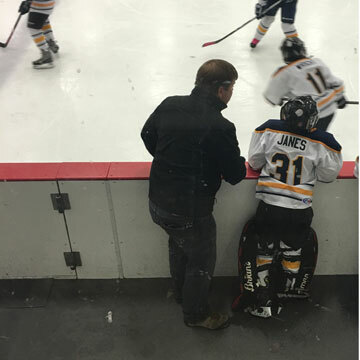 Jason spends his spare time playing hockey, coaching his sons in a variety of sports, volunteering as a short-term missionary, and serving at Calvary Baptist Church in Hannibal.